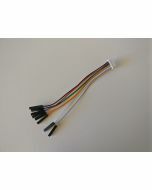 Single JST-SH 8 way plug to 3 pin servo plug cables. Pins 1-3 go to a single 3-pin plug. Pins 4-8 each go their own 3-pin plug. For use with SPRacingF3 Acro/Deluxe (IO_1, IO_2), F3/F4 NEO (IO), F7 DUAL (IO). Note: We used to ship these as a pair, now we sell them individually due to limited stocks. There is a new version of the cable available. See related items.